The past few days were crazy. Our country has been under rockets' attacks and life has been scary and stressful. I found it really hard to create anything, my mind just didn't have the energy to think about and be full of ideas like it usually is. I asked for some advice from my dear FB friends and they said "start with something small". Well...I decided enough is enough, I would force myself to create something, something small. 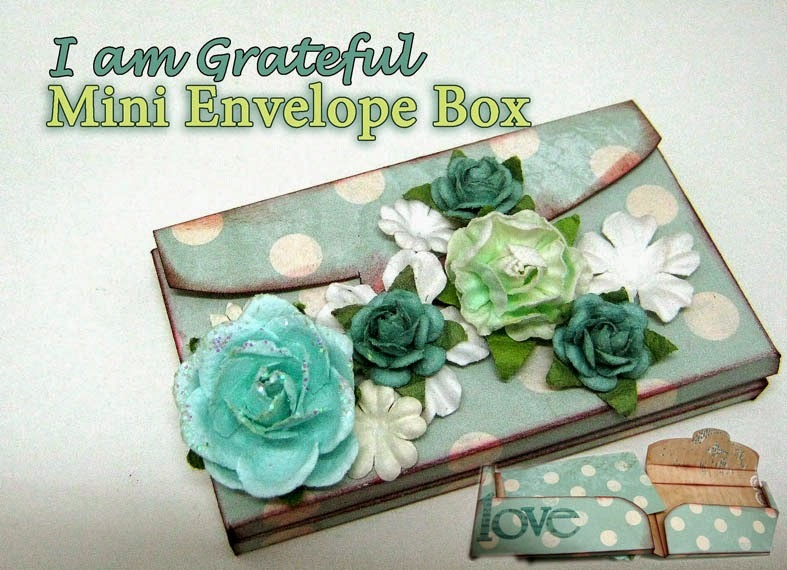 I wanted those things I'm grateful for to be with me all the time so I'll never forget, so I created a little mini envelope box to hold them. This box will be my treasure box filled with photos of my family and friends and small cards with inspiring words and sentences written on them, the kind of words that inspire me and give me strength. Thank you dear friends for standing with me, for supporting, praying and caring so much. You gave me so much strength and hope and I love each and everyone of you. What kind of treasures would you carry with you? Can you make a template of this box? It isn't available in the Netherlands i m afraid. Beautiful! and what a great idea for a template - I love it!